2.Blend sugar , Ghee and milk nicely. 3.Sift the flour with the cooking soda. Add this to the sugar-ghee-milk mixture. 4.Finally add the vanilla extract and mix it nicely. 5.Make a dough and divide into small balls. 6.Shape it into small balls of the required size and flatten it between the two palms. 7.Keep the balls onto a cookie sheet and bake for 20 minutes at 180 C.
8.Allow to cool and store in airtight containers. 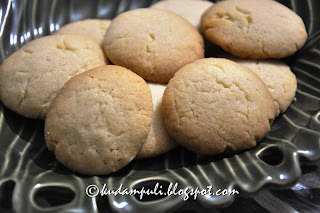 simple and quick yet yummy cookies!